In our last blog post, we pointed out the importance of idioms in a business setting by presenting a compilation of 50 widely used business idioms. 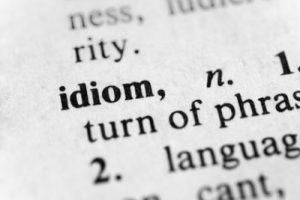 In this blog post, we want to pick up on the topic of idioms once again. There is no better way of sounding like a native English-speaker then knowing, when and how to use an idiom. Idioms give language its character and in many situations, there is no better way of communicating something then using an idiom. When talking to native speakers, you will learn that English provides you with an amazing range and variety of idioms and English-speakers love to resort to them whenever they can. So, to make a long story short: Step up your game (it’s crunch time!) and blow everybody away with your newly acquired knowledge of idioms. You’ll see, it’s a piece of cake! A drop in the ocean A very small part or insignificant amount of something big or whole A donation of 100,000 dollars is just a drop in the ocean compared to the millions that need to be spent. Actions speak louder than words It’s better to actually do something than just talk about it I am going to work for an NGO in Africa fighting climate change. Actions speak louder than words. Add fuel to the fire Whenever something is done to make a bad situation even worse than it is Don’t mention the product delay in the meeting. You are just adding fuel to the fire. A penny for your thoughts When you want to know what somebody is thinking Why are you staring at the sky? A penny for your thoughts! Ball is in somebody’s court It is up to somebody to make the next decision or step I have laid out my plan. The ball is in your court now. Barking up the wrong tree Look in the wrong place or accuse the wrong person I’m not responsible for this mess! You are barking up the wrong tree. Be a good catch Be someone worth marrying/having Donald is such a good catch. I hope, he’ll propose soon. Beat around the bush Avoid the main topic or not speak directly about the issue Don’t beat around the bush! We can have an open discussion here. Bend over backwards Do whatever it takes to help. Willing to do anything Our company is bending over backwards to satisfy our customers. Bite off more than you can chew Take on a task that is too big You bit off more than you can chew. You are never going to finish the presentation on time. Blow somebody away Be extremely impressed by something The product demo just blew me away. I’ve never seen such a powerful software. By the skin of your teeth You only just succeeded and nearly failed I hadn’t studied much, but passed the test by the skin of my teeth. Couldn’t care less Have a total lack of interest in something I couldn’t care less what my new co-workers think of me. Cry over spilt milk Complain about a loss from the past There’s no way to win back this customer. Don’t cry over spilt milk. Cry wolf Call for help when you don’t need it My new co-worker is constantly crying wolf. Crunch time The period of time just before a project has to be completed and everyone has to work hard I’m not getting much sleep these days, because it’s crunch time at work. Curiosity killed the cat Get into an unpleasant situation by being inquisitive He shouldn’t have searched for the secret files. Curiosity killed the cat. Cut corners Do something badly or cheaply They really cut corners when they built this office. The cubicles are way too small. Cut somebody some slack Give somebody a break/ not to judge somebody severely You have to cut me some slack. I already worked on the report the whole weekend. Cut to the chase Leave out all the unnecessary details and just get to the point In an elevator pitch you don’t have much time. You have to cut to the chase! Dig in your heels / Stick to your guns Refuse to compromise or change your mind My parents always wanted me to become a lawyer, but I dug in my heels / stuck to my guns and started my own travel business. Down to the wire Something that ends at the last minute or last few seconds With the deadline coming up and the project not being on track, the team worked right down to the wire to complete it on time. Drive someone up the wall To irritate or annoy very much The music my co-workers listen to at the office is driving me up the wall. Get out of hand Lose control of things The meeting got out of hand and people started yelling at each other. Get your head around it Understand something I just can’t get my head around the fact that my boss is not giving me a raise. Give the benefit of the doubt Believe someone’s statement, without proof I can’t check your results anyway, so I’ll give you the benefit of the doubt. Go down in flames End or fail suddenly and spectacularly Our company will go down in flames, if we don’t take these new startups seriously. Hear on the grapevine Hear a rumor or unconfirmed story I heard on the grapevine that our boss will be leaving us soon. Hit the books Study very hard I have to hit the books. My final exam is coming up soon. It takes two to tango Actions or communications need more than one person I don’t think, she did this by herself. It takes two to tango. Judge a book by its cover Judge someone or something based solely on appearance I really disliked the product’s packaging. But you can’t judge a book by its cover. Jump on the bandwagon Join a popular trend or activity This new software is going to disrupt the market. We should jump on the bandwagon. Kill two birds with one stone Solve two problems at once / with one action By cycling to work I kill two birds with one stone. If saves me money and I get to work out. Leave no stone unturned Do everything possible to achieve a goal I’ll leave no stone unturned until I find out who did this. Let the cat out of the bag Accidentially reveal a secret The CEO let the cat out of the bag about the company’s restructuring. Make a long story short Come to the point There’s not much time left. Let me make a long story short. Miss the boat Miss the opportunity to do something I think, I have missed the boat. They didn’t accept my application anymore. Once in a blue moon When something rarely ever happens You only achieve such an amazing return on your investment once in a blue moon. Piece of cake When something is extremely easy to do Piece of cake, with our new software we’ll win this customer for sure. Pull a rabbit out of a hat Do something unexpected I thought there was no fix to the software bug, but our programer pulled a rabbit our of his hat. Pull yourself together Calm down and act normally I understand you’ve had a bad day, but pull yourself together and get on with your job, will you? Run on fumes Continue to stay awake when feeling exhausted I really have to take a nap now. I haven’t slept for twenty hours and I’m running on fumes. Sell somebody out Snitch on someone or let their secret out I asked you to keep this information to yourself. I can’t believe you sold me out! Shoot from the hip Speak directly If you want to get on well with your new boss, try not to shoot from the hip next time. Sit on the fence Stay neutral and not take sides I’m sitting on the fence with this one. My team prefers solution A, but my boss favors solution B.
Skeleton crew The minimum number of people needed to keep a service/office operating Can you please come to the office this weekend? We’re operating with a skeleton crew at the moment. Step up your game Start performing better If you really want to win this competition, you’ll have to seriously step up your game. When pigs fly Something will never happen As long as my boss stays in office, I will have to wait for a raise till pigs fly. Whole nine yards Everything I’ll do whatever it takes to make my venture a successful one – I’ll go the whole nine yards. Your guess is as good as mine Have no idea, do not know the answer to a question We just don’t have enough information. Your guess is as good as mine. This entry was posted in Miscellaneous and tagged idiom, idioms. Bookmark the permalink.